Rolwaling trekking to the west of Everest and near the Tibetan border offers fascinating experience. A golden chance for trekkers who do not want to encounter a mass influx of tourists, but equally enjoy mother nature and splendid views of Himalayas & exploring beautiful waterfalls, Chhorolpa Lake, monasteries and landscapes. The Rolwaling trek is a purely tented camping trekking. Camping is fully organized and supported, with a team of guide, cook, Sherpas and porters accompany you. Rolwaling trekking takes you on an interesting passage wherein you will come across pristine glaciers, high passes and snow fed lakes. You will also get the opportunity for an intimate encounter of the Tamang and Sherpa communities living in this region. The trail which follows the course of the river Tamakoshi on the way to Simi Gaon adds an exciting element to Rolwaling trekking. Rolwaling trek is mostly along the Rolwaling River from the Valley it gets its name from, littered with unspoiled floral beauty and final parts of nature. On this trek, the glacier lake Tsho-Rolpo offers an experience of a lifetime. Mountaineers can attempt to climb Parchhamo (6187 m.) and Ramdung Peak (5925 m.) in Rolwaling treks. It is possible continuing trekking in Everest Base Camp or return from Namche Bazaar and short flight from Lukla. Asian Hiking Team organizes Rolwaling trekking as Guesthouses/Hotel trekking plus few nights camping basis for full board camping. Our guides have many years of guiding experience in Rolwaling region. Many of our guides and porters originally came from Rolwaling area. Our guides are trained in first aid and know how to handle any situation. We need to provide guides who can get people to feel involved in what they are experiencing, explain it thoroughly and keep them entertained. They know very well how to facilitate running smooth and safe trip appreciating the beauty of the Khumbu Himalayas. Our porters carry 25 to 30 KG, those all are Rai or Sherpa ethnic group and professional potters. Their first hand experience, local knowledge, expertise and humor on treks are invaluable. Season: March to may & Sep. to Nov. Highlight of Trip: Best mountain view, The rolwaling people and culture, adventure tashi labste pass, possible to explore Everest region, sherpa culture, monasteries, beautiful lake and river. Day 02: Prepare trekking & special permit. Day 03: Drive Kathmandu - Charikot & Ratmate, overnight at hotel. Day 04: Ratmate - Bhorle or Bagar, overnight at Guest house or tented camp. 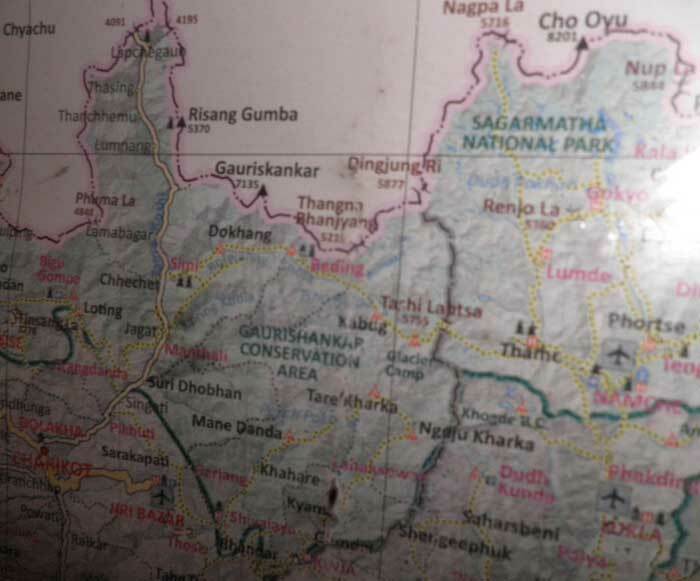 Day 05: Bagar – Jagat 1150, overnight at Guest house or tented camp. Day 06: Jagat - Simi Goun (Village), 2060m, overnight at Guest house or tented camp. Day 09: Nyimare trek to Beding 3690m. Overnight at tented camp. Day 10: Beding - Na 4183m, overnight at tented camp. Day 11: Na rest for acclimatize, overnight at tented camp. Day 12: Na - Chho-Rolpa lake 4,580m. Overnight at tented camp. Day 13: Chho-Rolpa lake –Glacier camp 4735m, overnight at tented camp. Day 14: Trek to Tashilapcha Pass 5755m. - Pachhermo B.C.4780m, overnight at tented camp. Day 15: Pachherpa Base Camp - Thame village 3820m, overnight at hotel. Day 17: Thame - Namache Bazaar 3440m, overnight hotel. Day 18: Namche Bazaar – Lukla airport 2840m, overnight hotel. Day 19: From Lukla to Kathmandu flight & transfer to hotel. Day 20: Transfer to airport for final departure. All land transportation by Tourist Coach,(Airport /Hotel/Airport). Local bus/Jeep to Singate (private transport need pay extra). Hotel accommodation in Kathmandu with BB Plan as itinerary - Twin Sharing Room. Major Meals; Breakfast, Lunch and Dinner by Camping. Accommodation during the trekking tented camping and Guest house. Domestic air tickets (Lukla to Ktm). All naccessary staffs for camping. Trekking insurance for all support crews and their daily wages. Trekking Equipment such as Sleeping Bag, Down Jacket and trekking Polls (if needed as clients request). Cancellation should be made 48 hours before departure and 25% cancellation charge is applicable beside Tax, transportation, permits and others fixed expensive. In case of incomplete Trekking / Tour / Rafting / Climbing / Expedition / Jungles safari / or others days due to the client own problem the amount of money paid not refundable. If clients want to do Trekking / Tour / Rafting / Climbing / Expedition / Jungles safari / or others tours more than itinerary, they can pay after back from tour with per day basic but should be permission with Tour guide / Leader. Arrive in Kathmandu, transfer to Hotel, final payment, meet staffs. Day 02: Sightseeing in Kathmandu and preparation day for trekking. City sightseeing with guide and private car/van/Bus, evening last trekking equipment checking, shopping, join staff meeting, Overnight in Kathmandu. Wake up call: 5.30 AM. Lunch Time: 12 to 1 PM. Day 04: Ratmate - Bhorle or Bagar, overnight at tented camp. Wake up call: 6.00 AM. Day 05: Bagar – Jagat 1150, overnight at tented camp. Wake up call: 6.30 AM. Day 06: Jagat - Simi Goun (Village), 2060m, overnight at tented camp. Day 07: Simigaun trek to Sakpa 2856m.overnight at tented camp. Hours: 4 - 7 hours. Day 08: Sakpa trek to Nyimare 3245m.overnight at tented camp. Day 11: Rest day in Na (4183 meters). Wake up call: 7 AM. Starting Time: Rest day so as talk with guide. Wake up call: 4.30 AM. Day 18: Namche to Lukla (2800 meters), 7 hours. Day 19: Lukla to Kathmandu / Farewell Dinner. Early morning flight at 7 AM than transfer to hotel, finish trip, free day, join farewell dinner. Day 20: Departure from Kathmandu. Note: On this trek require some climbing and camping equipment so please contact to Asian Hiking Team.